Learning Links International was successful in 2016 in gaining funds to undertake initial research into the links between Jamaican and Welsh Poetry, see the JamRy website. However plans to turn this research project into a Welsh and Jamaican Poetry tour of Wales as part of the Cymru / Jamaica Festival are now focussed on 2018 when we will focus on our shared histories and shared passion for poetry as part of the newly established Jamaica Wales Alliance. This is supported by the North Wales Jamaica Society, Learning Links International and the Jamaica Wales Alliance. Welsh poet, Rhys Trimble, invited Jamaican poet, Yasus Afari, to perform at the Blue Skies in Bangor as part of the North Wales International Poetry Festival in Black History Month in October 2015, following up on the very successful event put on at the Moyleci Environmental Centre by Learning Links International a few years ago. The main tour will now take place in 2018, with work done during BHM 2017 to explore and pilot options. We also intend to include school workshops that will support the production of a Wales / Jamaica Youth Anthology of Poetry presented tri-lingually. Yasus Afari met collegues at Moyleci Environmental Centre during the summer in 2010 and with support from Learning Links International, put on a great "Building Bridges" event with fellow poet Richard Douglas Pennant at Moyleci. 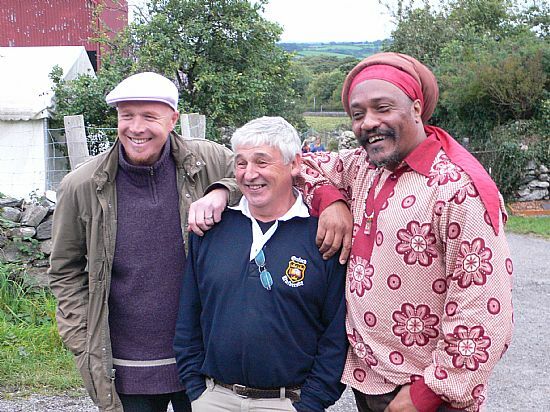 Pictured here are poet Martin Daws, John Fazey and Yasus Afari at Moyleci.